Lifetime beacon kayak - the 12' tandem kayak has a 500 lb. (227 kg) weight capacity and seats up to 2 people. 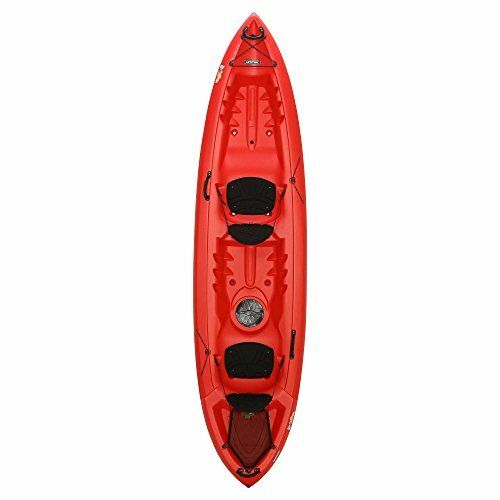 This 90620 comes in Red and is a "sit-on-top" (sot) tandem kayak. It comes with self-bailing scupper holes, (2) CRS+ quick-release ultra Lite seats, (4) carry handles, (1) skeg wheel, storage hatch, cargo net lacing system, and (2) paddle keepers. Blow-molded with a 5-year limited warranty. The lifetime Beacon kayak has the stability and performance of a smaller kayak with added features and upgrades, taking kayaking to the next level. This tandem kayak is stable for play time and has amazing speed and tracking to get you to your destination. The quick Release seats, footwells to fit any size paddler, center storage hatch, rear tank well with cargo lacing system, and innovative easy roll skeg wheel makes this the perfect kayak for a day on the water. We've thought of it all.